Robert Saxton, born in London in 1953, has become one of Britain’s most highly esteemed contemporary composers, in touch with his times and yet with an accessible lyrical thread running through his music. In its bell-like sonorities, clear textures and ritual manner, Saxton’s piano music – heard here in the first-ever album devoted to it – suggests an almost oriental fascination with light and the way light refracts and diffracts. Even so, it is audibly music written by an Englishman. In the two Books of Saxton’s Hortus Musicae in particular, this fascinating confluence generates a soundworld somewhere downstream from Takemitsu and Tippett, giving these gardens of music both a ceremonial dignity and sense of spring growth. Hailed as a pianist of ‘amazing power and panache’ (The Daily Telegraph), Clare Hammond is recognised for the virtuosity and authority of her performances and has developed a ‘reputation for brilliantly imaginative concert programmes’ (BBC Music Magazine, ‘Rising Star’). In 2016, she won the ‘Young Artist Award’ of the Royal Philharmonic Society in recognition of outstanding achievements. She is a champion of modern repertoire: this is her sixth album of music by a living composer, and she has given 35 world premieres to date. Clare completed a BA at Cambridge University, where she obtained a double first in music, and undertook postgraduate study with Ronan O’Hora at the Guildhall School of Music and Drama. As both composer and teacher, Robert Saxton has been a familiar figure on the British new music scene for the past four decades, often to be seen cutting a distinctive figure in the audience at contemporary concerts. Born in 1953, his musical gifts were apparent early on. He was informally mentored by none less than Britten, before more formal studies with Elisabeth Lutyens (whose music he has consistently championed), Robin Holloway, Robert Sherlaw Johnson and Luciano Berio. His early musical experiences were shaped by the distinctive programming of the BBC Third Programme in the 1960s, and among the discernible influences on his emerging musical style were the Second Viennese School (especially Webern and Berg), Bartók, Carter and Tippett. Several discs of Saxton’s music have appeared over the years, notably on the NMC label, but Toccata Classics are to be applauded for this first disc devoted to his music for solo piano. Among the key elements of Saxton’s musical style are its clearly graspable, goal-oriented formal structure; a tonal/harmonic background (often around a single pitch), with more or less complex middleground and foreground (surface), and shifting perspectives; a penchant for bell-like sonorities; and dance-like qualities, often as an expression of Saxton’s Jewish roots. His music combines formal and technical rigour with an imaginative and engaging soundworld, while encompassing a gradual stylistic shift towards more outwardly tonal surfaces. 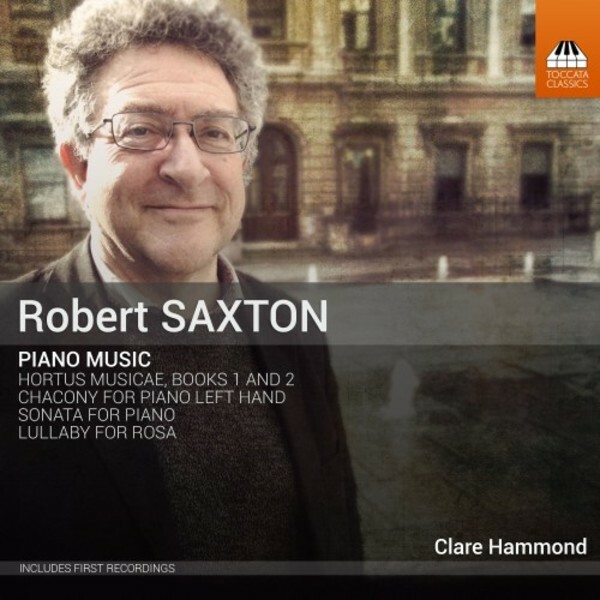 Pianist Clare Hammond has a close relationship with Saxton’s music. Her disc opens with the Chacony for Piano Left Hand (1988), the work with which she first impressed the composer. It was originally commissioned by Oliver Knussen for Leon Fleisher (who at that time had lost the use of his right hand), and here it receives a radiant performance, making light of its formidable technical demands with playing that combines purpose and animation. The main works on the disc are the Sonata for Piano (1981) and the two books of Hortus Musicae (2013 / 2015). The Sonata is gesturally similar to the Chacony, but is formally more ambitious. Cast in a single movement, it recalls the background influence of both Berg and Bartók, and is every bit as compelling in this exceptionally assured account. Its 11-minute span seems not a moment too long, and (like all good sonatas) it seems to capture a whole world in miniature, building to a memorable close. Hammond herself is the dedicatee of the Hortus Musicae (‘Garden of Music’), and her readings carry a special authority. The five movements of the first Book feel more akin to studies, and they successively explore dreams, time, singing, infinity and dance. Particularly striking are the insistent repeated tone that frames ‘Hortus Temporis’, the meditative mood of ‘Hortus Infinitatis’, and the ecstatic feel of ‘Saltatio Hortensis’. Book 2 comprises seven movements (the twelve movements of the two books are organised around the twelve tones of the chromatic scale), and they seem to have a more discursive, narrative feel about them. Highlights include the luminous ‘Light on the Water Garden’, with its shimmering figuration, and ‘Beech Bank (à la recherche)...’, whose snatches of Haydn, Chopin and Donizetti are incorporated with a facility reminiscent of Saxton’s teacher Berio. The final movement is an unorthodox fugue whose title (which translates as ‘The Garden of the Swift-Winged Spirit’) suggests both flight and chase, its ending gradually receding from the listener. Proceedings are brought to a close by the brief Lullaby for Rosa (2016), written as a ‘welcome’ gift for Hammond’s infant daughter. More conventionally tonal than the other works recorded here, it makes for a beguiling conclusion to a compelling disc, ideal as an introduction to Saxton’s multifaceted music, and all realised with commanding but unshowy aplomb by Clare Hammond and the Toccata Classics team. The detailed autobiographical and musical notes from Saxton himself are a considerable bonus.